Here’s the thing about steakhouses in Las Vegas: every major hotel and casino has one... and most of ‘em are really, really good. (And that’s not to mention all the ones that aren’t in a hotel or casino.) Deciding on the perfect place to sink your teeth into a tender piece of meat can be tough. 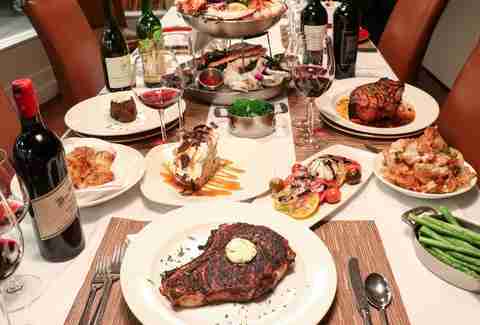 If somebody would just put together a complete guide to Sin City’s best steak spots... oh, wait! This energetic fine dining spot could be the best reason to visit Downtown Summerlin, an outdoor shopping plaza with a surprisingly strong lineup of restaurants. What sets it apart: You might be getting the best-prepared steaks west of the Strip, but everyone keeps talking about the mac & cheese waffle, so don’t forget to order one on the side. Plus, the interior is designed to feel like a Hamptons summer party, with wide-open dining areas, tall ceilings, and white wooden beams holding the roof in place. With a modern decor to match the contemporary style of The M, this stylish steakhouse is known for its powerful wine list as well as its charcoal-grilled steaks. 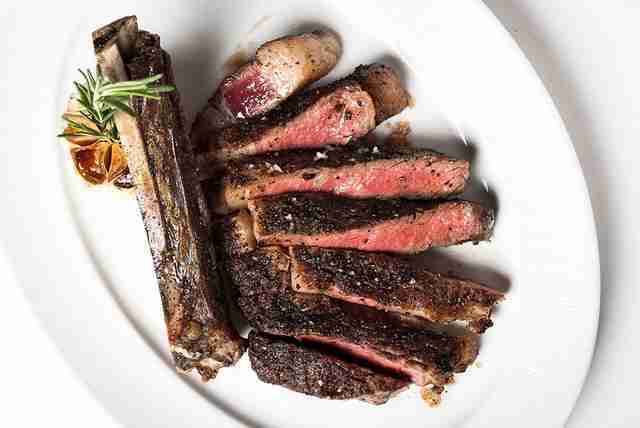 The bone-in prime cuts are all from the Double Fork Ranch in Montana. You can't go wrong with the filet, ribeye, or sirloin -- as long as you order the lobster-topped flatbread as an appetizer. What sets it apart: Return trips are encouraged by the "Chef's Butcher Board" of wood-grilled exotic meats that change by the week. You won’t find a better restaurant this close to the Strip without actually being on the Strip. Once you figure out where the Royal Resort actually is, you’ll be glad you stopped by one of the best-kept secrets in Vegas. What sets it apart: The atmosphere offers a little something for everyone, with fire pits on the patio, empty reels of film hanging from the ceiling, and a vintage Vegas style that feels modern at the same time. 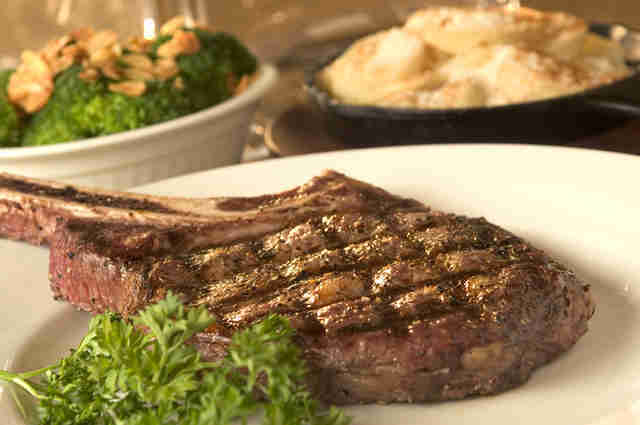 Highlights include a 21-day, wet-aged filet mignon and 28-day, dry-aged bone-in ribeye. Check out the wide range of toppings, which include a foie gras medallion, herb-roasted bone marrow, or South African lobster tail. Dinner isn’t complete without the signature popovers made with gruyere cheese, but the 28-day dry-aged New York strip is the best reason to return for a repeat visit. What sets it apart: The Sterling Brunch on weekends gives you a chance to chow down on one slice of prime rib after another along with unlimited Perrier-Jouët Champagne, mimosas, and Bloody Marys. 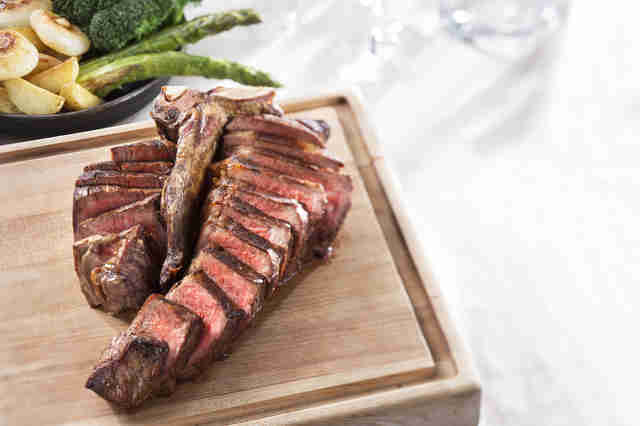 Mario Batali’s Las Vegas steakhouse takes things up a level, perhaps more than anyone else, with grass-fed, grain-finished Niman Ranch ultra-prime cuts that are dry-aged at the restaurant's offsite facility for a minimum of 90-120 days. An old steak is definitely a good steak. What sets it apart: Red meat connoisseurs know to ask about the Riserva program, which dry-ages select cuts anywhere from seven to eight months. It's sold by the ounce and you won't know if one is available unless you call the same day. The menu used to be a bit all over the place, but has found its identity with a stable kitchen and management team in place focusing on what the restaurant does best: wet and dry-aged steaks with limited cuts of Wagyu sold by the ounce. Request a curtained private booth and start off with the shrimp cocktail, which is given a sinus-clearing spicy twist and served on a salad. 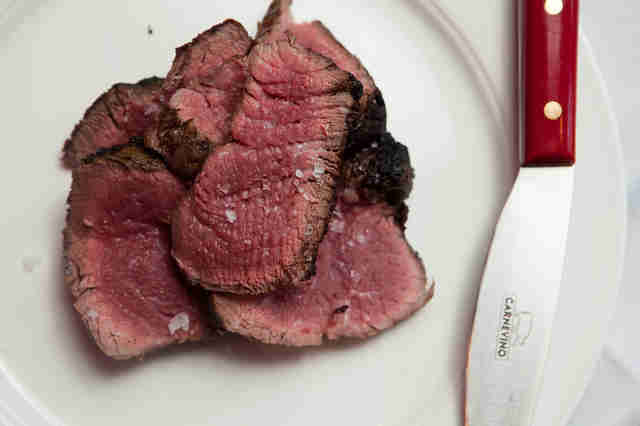 What sets it apart: Each steak comes with a serving of bone marrow as garnish. Found at the end of a long hallway, the Country Club is a quiet escape from the madness of the casino floor, whether you choose the Snake River Farms strip or a cut from the prime rib cart. 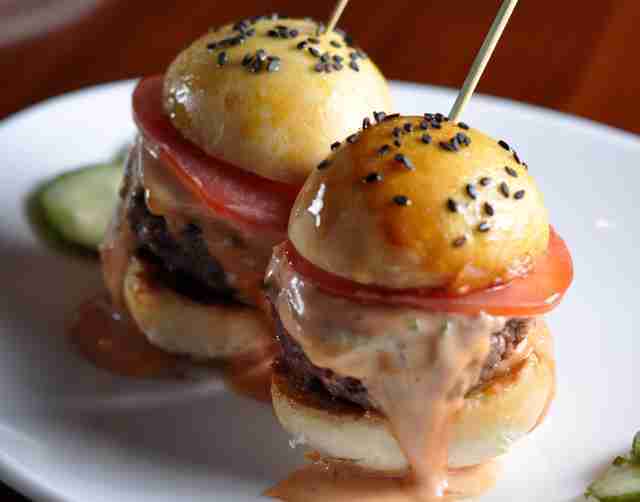 For something more casual, the restaurant also offers a Wagyu beef hot dog and the Impossible Burger, an all-vegan burger that's nearly impossible to tell apart from the real thing. What sets it apart: An outdoor view that overlooks a waterfall, an 18-hole golf course, and Steve Wynn’s private villa. 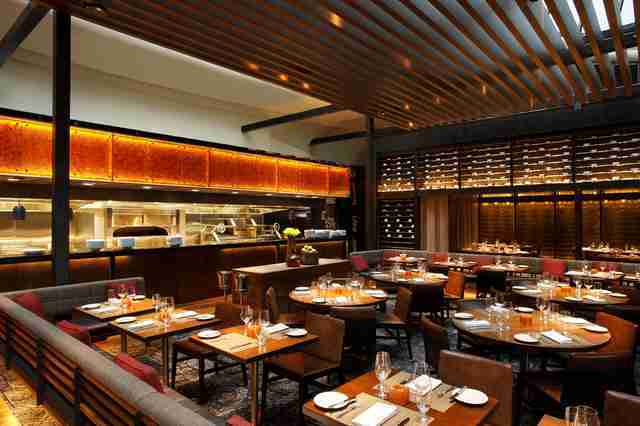 Tom Colicchio’s first steakhouse in Las Vegas is known for simple recipes, with quality ingredients from small family farms, as well as a deep selection of Scotch, bourbon, and New World wines. What sets it apart: The braised short rib is probably the best you’ll find at any Vegas steakhouse, but if you want to spend a few more dollars, check out the domestic or Japanese A5 wagyu cuts as part of a worth-the-money three-course menu. 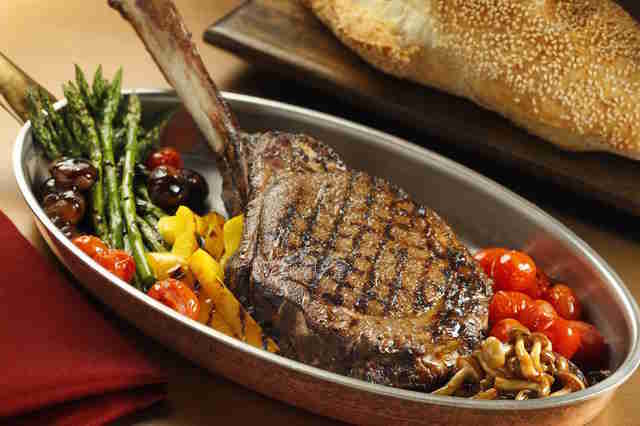 It’s been around since the late '90s, which seems like several lifetimes for a Vegas hotel restaurant, but Emeril Lagasse’s steakhouse continues to pack in crowds, serving about 150 bone-in ribeyes each night. What sets it apart: The steaks come with a Creole seasoning in a nod to Lagasse’s New Orleans roots and there’s a whiskey menu with more than 700 choices from eight different countries. 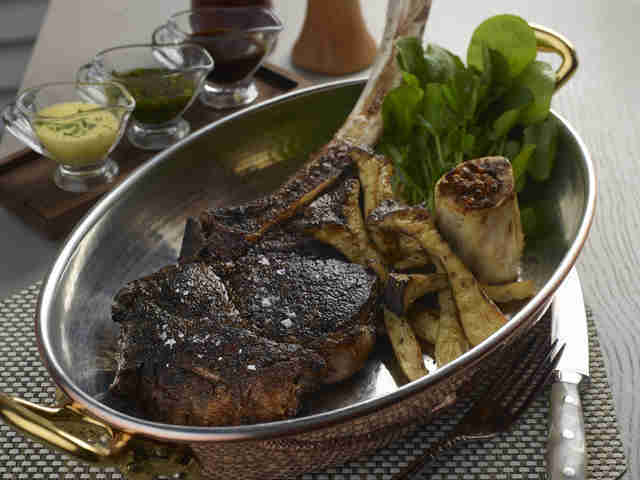 The only restaurant capable of giving Andiron competition as the best place to get a steak in the Summerlin area, Echo & Rig's emphasis is on quality cuts cooked over red oak. Each one is served with house-made garlic chips and a choice of sauces, but there are plenty of small bites and vegetables to order on the side, tapas-style. What sets it apart: The in-house butcher shop is in full view next to the front door, with highly qualified professionals eager to share some info and history about that hunk of red meat you’re about to order for dinner. A classic old-school steakhouse that has seen Frank, Elvis, and other notable Vegas legends pass through its doors over the years. What sets it apart: Save room for the cherries jubilee or bananas Foster, which you can get because the GS has been around so long that it’s grandfathered into still being allowed to have an open flame in the dining room. A local favorite that is easily one of the best places to order a steak in the Henderson area, with an elegant dining room and the best selections of wagyu southeast of the Strip. What sets it apart: The Kitchen Sink Caesar salad puts a creative spin on the old favorite with a horseradish dressing and shrimp, avocado, tomatoes, and hearts of palm thrown into the mix. As for steaks, the 20oz chateaubriand for two could be the single best reason to make the drive to Henderson. 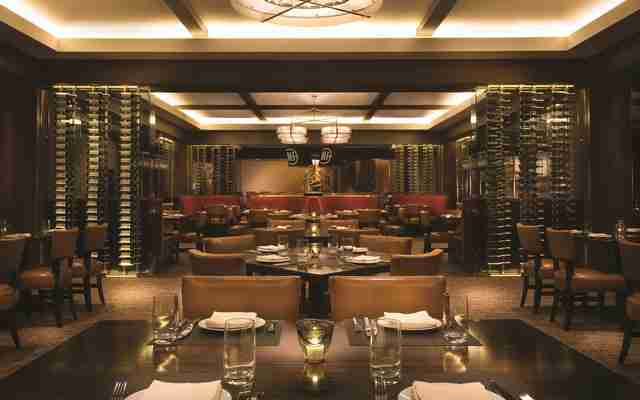 Tom Colicchio’s second Las Vegas steakhouse can be found nestled among the lagoon and plant life of the Mirage’s atrium area. 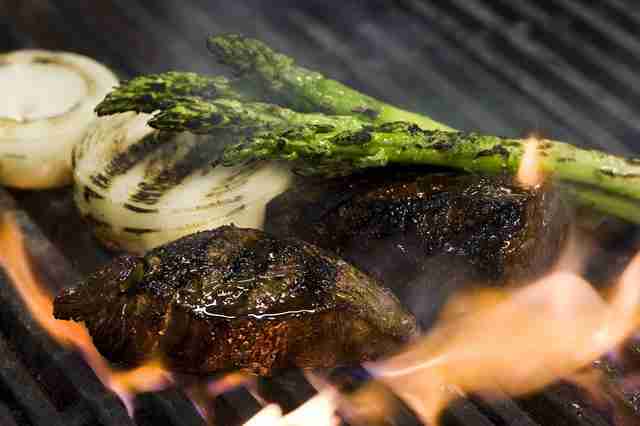 What sets it apart: Every piece of meat is cooked over a wood or charcoal fire. Other perks include a deep whiskey menu and a chemical-free dessert menu that is among the very best (and cleanest!) in Vegas. After conquering fine dining at the Bellagio, chef Jean-Georges Vongerichten gets a chance to play with fire a bit, cooking steaks over an open flame and lava rocks with Asian-inspired seasonings. What sets it apart: The most tender cuts of wagyu-style beef from cows raised on the open pastures of Australia. A restaurant with Miami roots that go back more than 100 years in the middle of a busy upscale shopping mall. 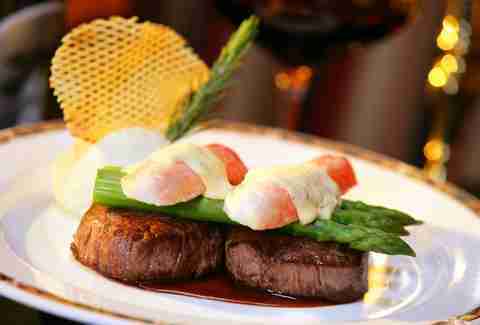 What sets it apart: Want an awesome filet, but usually find ‘em a little too small? 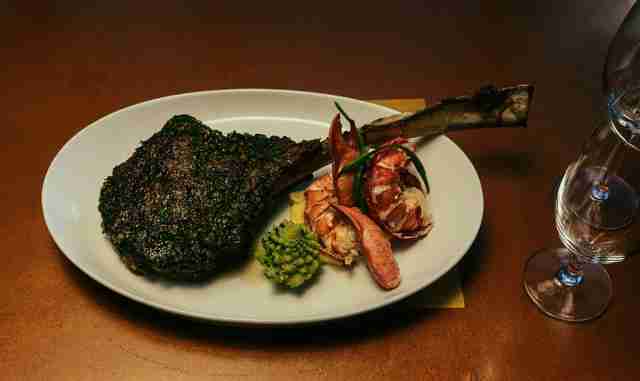 Joe’s has a prime 16oz bone-in filet that can help create the world’s best surf n’ turf when combined with large stone crabs from the Gulf of Mexico. The Detroit steakhouse fits in perfectly with the classic Downtown atmosphere of Fremont Street while serving up made-from-scratch pasta and other Italian dishes to go along with the 30-day aged cuts of meat. 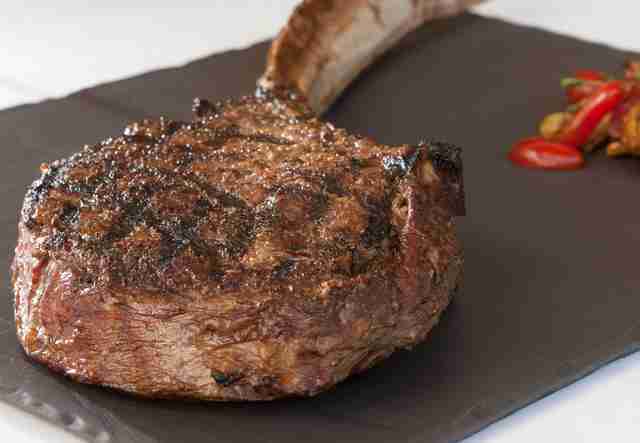 What sets it apart: The only steakhouse not on the Strip that regularly offers cuts from Pat LaFrieda and Chicago’s Stockyard Premium. 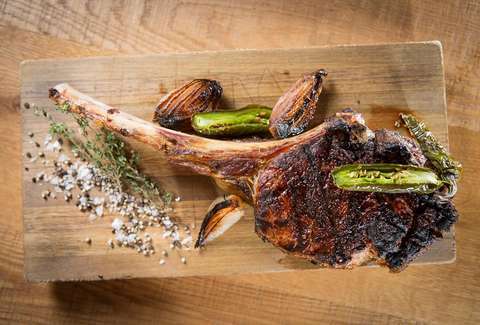 Taste the quality for yourself with the 32oz long-bone Andiamo tomahawk. If you're craving red meat on the drive between Las Vegas and St. George, pull over at the CasaBlanca resort in Mesquite. It's home to Katherine's, a steakhouse with plenty of old-school vintage charm, menus that light up in the dark, and shoestring onions served with every cut of steak. What sets it apart: The tableside presentations date back to the glory days of supper clubs, whether it's the hot spinach salad with a sweet taste of brown sugar or the cherries jubilee for dessert. Don't leave without wrapping things up with the flaming spectacle that goes into making the cafe diablo combo of coffee and liqueur. 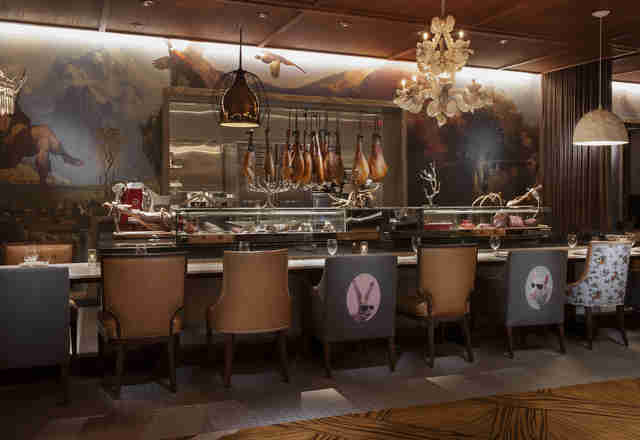 The newest steakhouse in Las Vegas was put together by the family behind Morton's The Steakhouse, featuring familiar favorites with room for experimentation like the caviar sliders and surf 'n' turf tartare of filet and ahi tuna on the same plate. All bases are covered with American, Australian, and Japanese Wagyu on the menu. It's hard to find a better bite in town than the Miyazaki. What sets it apart: The restaurant was built from the ground up within the Hard Rock and includes two levels of dining, as well as a private bar room for large parties. The second floor has a skylight and neon-filled views of the Strip to complement the lively social atmosphere. 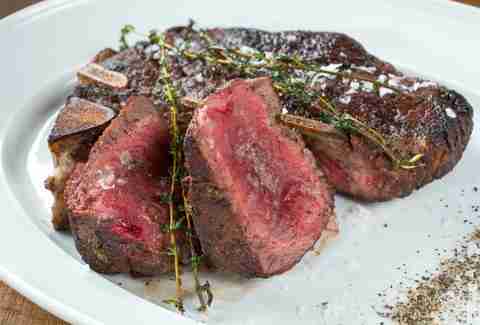 This French-inspired steakhouse provides an emphasis on service and decidedly American, corn-fed Iowa steaks aged for 28 days. Its awesome patio seating is dog-friendly, making it one the very few (if not only) steakhouses in Vegas where you can bring a pet. 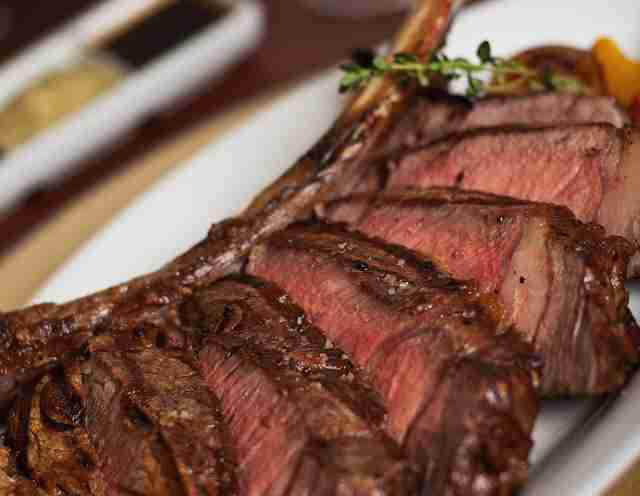 What sets it apart: There are more than 60 different artisanal farm cheeses to go with that first glass of French red wine, as well as a fresh-as-they-come oyster bar, but the highlight is the 32oz prime bone-in rib eye tomahawk, carved tableside. Wash it down with a draft beer from Burbank's Verdugo West Brewing Company. A fun and lively social spot with a lounge area that’s among the best places to grab a drink... as well as a steak... before a wild night out in Vegas. The namesake restaurant of former mayor and mob lawyer Oscar Goodman has a one-of-a-kind view of historic Fremont Street from the second floor of the Plaza Hotel, which made it the perfect backdrop for a dinner scene in the movie Casino. What sets it apart: Goodman himself hosts a regular dinner series every few months, sharing stories from the mob days. It’s some of the best entertainment you’ll find in Vegas while chowing down on a perfectly charred New York strip. Don’t forget to order a martini. Photos and furniture celebrating cowboy culture that wouldn’t look out of place in the middle of Texas. 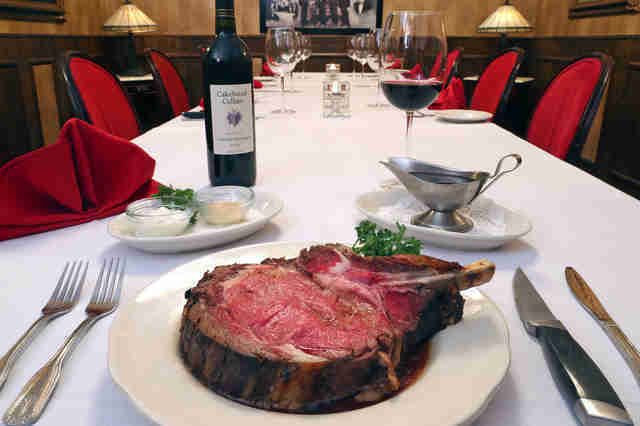 What sets it apart: One of the best values in a casino that tends to attract locals, and one of the few places where you can get a dry-aged prime rib for less than $30. 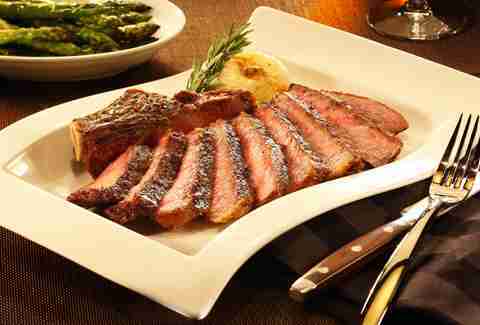 All steaks include a salad and baked potato. It’s like taking a step into an Old World wine cellar. It’s hard to find steaks so good this far east of the Strip. They’re a good value, too. 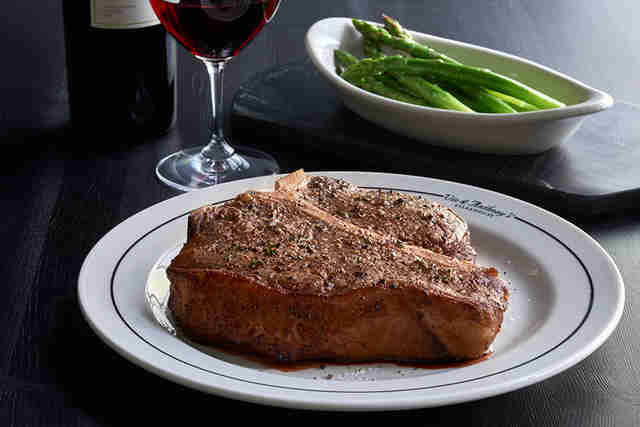 Even the porterhouse is just $36. What sets it apart: The staff is unusually knowledgeable about wine, with each server required to take the Level 1 sommelier exam. So go ahead and let loose with questions about regions and varietals. A party atmosphere with giant portions that are perfect for family-style dining... although you’re more likely to find a bachelorette party or rowdy group of businessmen than parents dragging along their children. The best steakhouse in rural Nevada is the ideal pit stop if you’re in (or driving through) Pahrump. 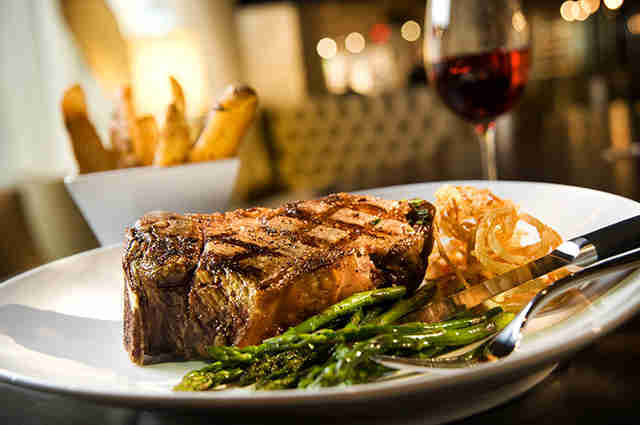 What sets it apart: No surprises on the menu, but you’ll save more than a few bucks compared to the more well-known steakhouses on the Strip. That extra money could come in handy if you’re in Pahrump to visit the closest legal brothel to Las Vegas. An under-the-radar steakhouse that’s tucked away on the second floor of Planet Hollywood, it’s not the only place with prime cuts of beef, but there are few competitors that can cook them so perfectly, with the right amount of charring on top. What sets it apart: The bright-red dining room is covered in authentic flapper-era photographs that were found in the basement of the original Strip House in New York. Also, the black truffle creamed spinach is among the best side dishes at any steakhouse in Vegas. Michael Mina has four restaurants in Las Vegas. This is one of them. It’s a steakhouse. And it’s awesome. 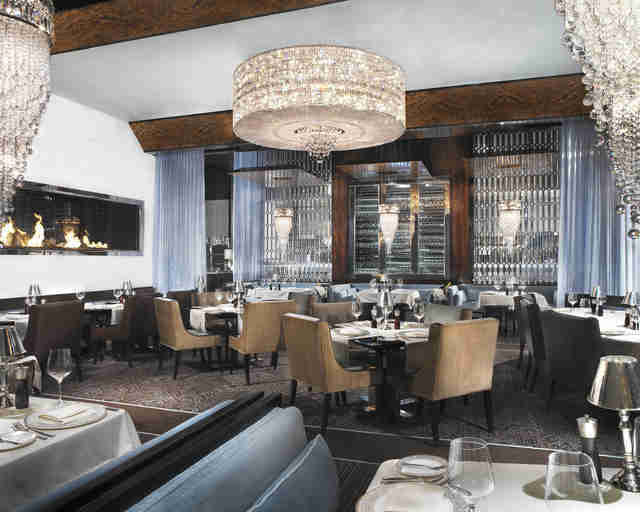 What sets it apart: A modern look that offers a nice contrast from some of the other more traditional restaurants at Mandalay Bay, along with a wood-burning grill and duck fat fries that are the perfect appetizer for any meal. The restaurant looks out on the Lake of Dreams, a man-made body of water which is a spectacle in and of itself, regardless of what's on the menu. 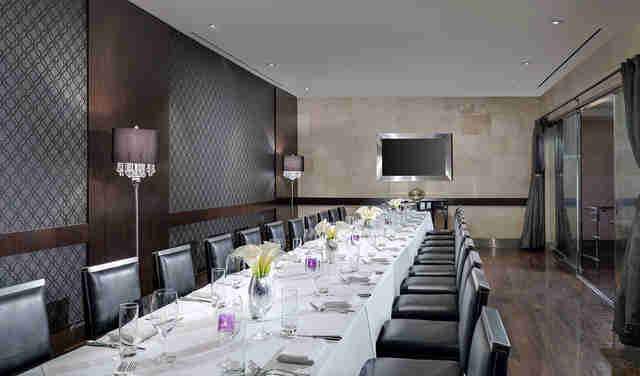 A traditional steakhouse menu in a bright, modern dining room. What sets it apart: Head outdoors to the patio, where there’s plenty of room and a view that overlooks the Red Rock. Pro tip: enjoy your drinks and appetizers there before heading indoors for the rest of your dinner. Binion’s may not rent rooms, and it may no longer host the World Series of Poker, but it has slot machines, a machine to validate parking, and a glass elevator that will take you to one of the most historic steakhouses in Vegas. What sets it apart: A sprawling view of Downtown Vegas from the 24th floor. The Luxor is one of those casinos that doesn’t get a lot of love for what lies underneath its giant black pyramid. But Tender is a nice alternative to the average steakhouse, with a comfortable atmosphere and an eclectic menu that mixes things up. 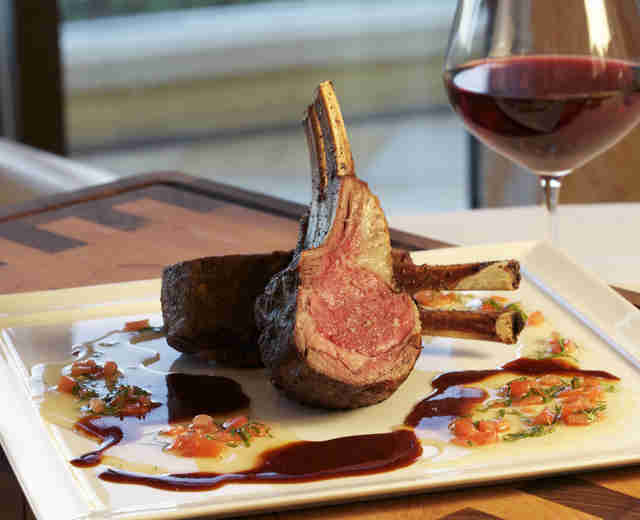 What sets it apart: Dishes made with wild game, like bison, wild boar, elk, and venison. There’s also a large cheese selection and a menu of wine pairings for the latter. The only thing in Circus Circus that everyone can agree is pretty darn good. In fact, it’s so good, it really belongs in a different hotel altogether. The carpet could probably be replaced, although it does add a little character to the vintage steakhouse atmosphere. What sets it apart: The fun part is seeing the dry-aging room as you walk in, as well as a peek into the open kitchen area, where the steaks are cooked on a mesquite charcoal broiler. A classic old-school dining room with deep private booths that feel like private apartments. 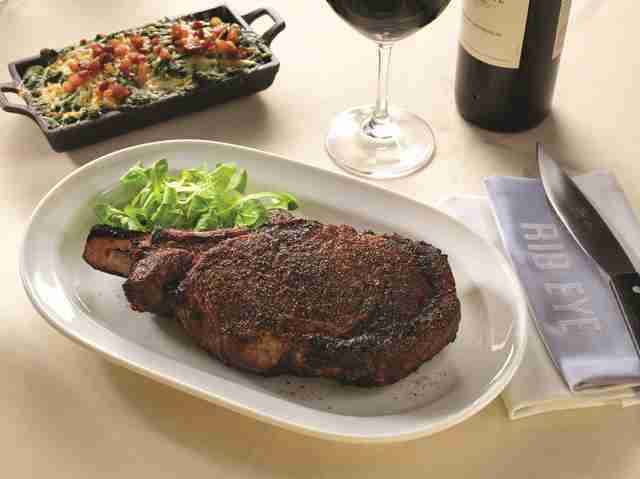 What sets it apart: The porcini-crusted rib eye offers a little sweetness to go with the savory bite of your steak. The perfectly cooked, prime Midwest grain-fed steaks are good enough on their own, but make sure to order the side of wild mushrooms. If you want to take a break from the steak, go with the fried lobster mac & cheese. 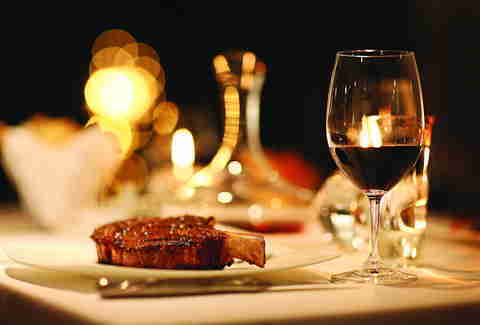 What sets it apart: Click here for the “Distinctive Dining” three-course deal. 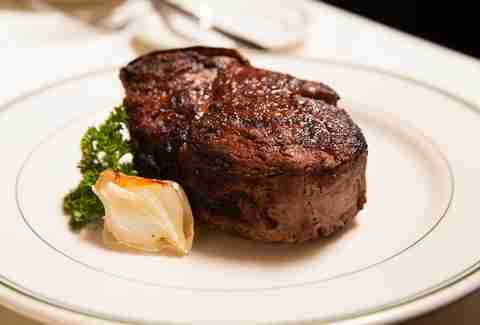 It’s one of the best steakhouse values in Vegas. Located on the 50th floor, VooDoo is the perfect pre-party destination where you can not only get a prime 14oz New York strip, but also the infamous Witch Doctor cocktail, a fish bowl loaded with dry ice, juice, and five different kinds of rum. Dinner also gets you free entry into VooDoo nightclub. 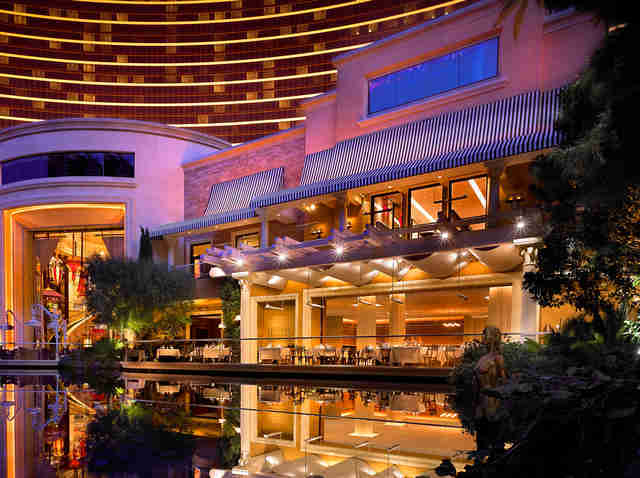 What sets it apart: The best view from any steakhouse in Las Vegas. Its patio is also where you can hop on the VooDoo zip line and take a trip between the two towers of the Rio. Rob Kachelriess loves his steaks medium-rare... and his vegetables well done. Follow him on Twitter @rkachelriess.